If you eat pork, get ready to pay a lot more for it. A highly contagious pig virus known as “Porcine Epidemic Diarrhea virus” has now spread to 27 different U.S. states, and it has killed more than 4 million hogs since last May. Smithfield Foods, the largest pork producer in the entire world, estimates that approximately 10 percent of all adult female hogs in America have contracted the disease already, and there is a very good chance that any offspring that they have will die. That is because the mortality rate for this disease for piglets is between 80 and 100 percent. Fortunately, we are being told that this disease does not affect humans. However, considering the fact that California is in the midst of one of the worst droughts in recorded history, and considering the fact that the U.S. cattle herd has shrunk for seven years in a row, this pig virus is coming at a very, very bad time. Arizona is the latest state to confirm cases of the deadly Porcine Epidemic Diarrhea virus, a highly contagious pig disease, increasing the tally of U.S. states with confirmed cases to 27, a group of animal health researchers said. This is a disease which can be spread from mothers to their children, and that is why it is so troubling that approximately 10 percent of all adult females now have this virus. The following is an excerpt from a recent Fox News article. 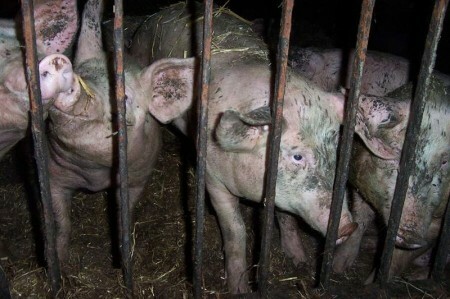 Smithfield Foods Inc., the world’s largest pork producer, and other meatpackers estimate that about 10% of the nation’s sows, or adult female hogs, have been infected by the virus, which can spread to their offspring. Perhaps you are thinking that you will just start eating more beef for a while. And under normal circumstances, that would be no problem at all. Unfortunately, the beef industry is having huge problems right now as well because of the horrible drought in the western half of the country. The total size of the U.S. cattle herd has been shrinking for seven years in a row, and it is now the smallest that it has been since 1951. But today we have more than twice as many people as we had back in 1951. So we have got a huge problem. Our cattle herd is shrinking and an extremely contagious virus is killing off our pigs. This isn’t a major crisis just yet, but if these trends continue we will definitely get there. But even if a major crisis is averted somehow, without a doubt the price of meat in America is going to be rising for quite some time to come. And perhaps it is fitting that a pig virus is sweeping the nation, because we have literally become “pig people” in the eyes of the rest of the world. We like to think of ourselves as “good examples” that the rest of the world should follow, but the truth is that pretty much all that we are giving the rest of the world these days are really, really bad examples. While performing her song “Swine,” the singer was joined by someone named Millie Brown. Brown is an artist of sorts who specializes in painting with…vomit. That’s right, she ingests colored liquid and then sticks her fingers down her throat and literally vomits all over a canvas. On Thursday, Brown did just that – except there was no canvas: She vomited a green liquid onto Lady Gaga. Is this what our country has turned into? For many more examples such as this one, please see two of my previous articles entitled “16 Examples That Show The United States Has Become A Seriously Messed Up Country” and “55 Things About America You May Not Know“. The sad thing is that Lady Gaga has tens of millions of adoring fans in this nation, and stunts like these only tend to increase her popularity. Now that we have gotten to the point where having someone vomit on a woman is considered to be “entertainment”, it is hard to be optimistic about the future of this nation. But perhaps there are some out there that believe that I am being too harsh.